Representative quote: "That's like pulling a dead horse." Angela, an Oklahoma girl who got to Texas as soon as she could, is a whirlwind of activity, a juggler of jobs, a connoisseur of hard work and one of the original 'A's in Point A Media. Before Angela and Angie teamed up to start Point A Media in July 1999, Angela spent 13 years as a senior account executive for KTRE-TV. "In her previous life," she was an auditor for a major department store chain and has advised clients on many services including burial arrangements (true story, at one point Angela worked in a funeral home). Angela worked with some musically inclined volunteers to help create the Blueberry Bluegrass Concert in the Park held annually on the Friday before the Texas Blueberry Festival. Angela loves to garden and serves as chair of the Nacogdoches Garden Capital of Texas Committee. She also serves on Nacogdoches Parks and Recreation Board. 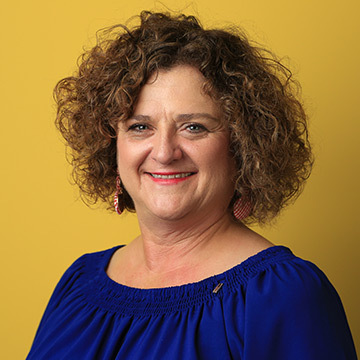 the Angela is a past chairman of the Nacogdoches County Chamber of Commerce and has served on many chamber committees, including fundraising, the Total Resource Campaign and the Blueberry Festival. She is a graduate of Leadership Nacogdoches, and she has also served as campaign chair and president of United Way and as president of Nacogdoches' Business and Professional Women. On Saturdays you can find Angela outside at a football game or hanging out in her home on Lake Nacogdoches, and on Sundays she is at Redeemer Lutheran with her family– her sons Henry, Hunter and Evan and her beautiful daughters-in-law Laura and Haylie. *CPP, CPM, RVF, PBA, ROI... yeah, she knows them ALL.